One of my favorite things about fall is that I know that our local produce markets will be overflowing with seasonal, just picked apples of every color. Although the old saying “An apple a day keeps the doctor away” may be stretching things just a bit, apples are one healthy fruit option that are always easy to find, are relatively inexpensive, and are very easy to store. A a crisp sweet or tart apple is a satisfying snack that can be enjoyed anytime of the day and can be easily stored in lunches for the entire family. Most varieties of apples in the marketplace today are rich in vitamins A, B, and C, and also contain magnesium, iron, and manganese. Apples are also a fairly good source of fiber, particularly if you consume the skin along with the flesh. The phytonutrients in apples can help you regulate your blood sugar as recent research has shown that apple polyphenols can help prevent spikes in blood sugar through a variety of mechanisms. The pectin in apples lowers LDL (“bad”) cholesterol and supplies galacturonic acid to the body which lowers the body’s need for insulin and may help in the management of diabetes. Apples have a fairly extensive range of flavors depending on the varieties you choose from quite sweet to much more tart. Some varieties are better for baking while others are best simply for snacking on raw. When buying apples, try to buy ones that are in season as apples lose their flavor, juiciness and crispness when kept in cold storage too long. Choose firm, smooth, and shiny skinned apples that feel heavy when you pick them up. 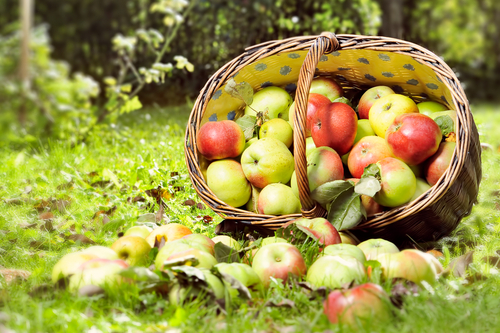 Look for apples that are fresh smelling with a full apple aroma. Apples will continue to ripen after they have been picked, so once you buy them and bring them home, keep them in a well ventilated bag in the refrigerator for up to a week. Braeburn – These apples can be eaten as is, but are also good for cooking. They have a sweet yet tart flavor and a red blushed skin. These apples are harvested from fall to early winter. Golden Delicious – With freckled yellow golden skins these apples are easy to pick out and since they maintain their shape well when cooked, they are often used in cooking. Granny Smith – Harvested in October, these bright green apples have a vey tart flavor but work well in baking, cooking as well as eating. Honeycrisp – One of the newer varieties in the market, this apple is very crisp and juicy with a balanced sweet to tart flavor. Pink Lady – Another newer variety, these apples are known for their pink blushed skin and crisp, juicy flesh. These apples are good for both eating and baking. Red Delicious – A thick red skin with distinct ridges at its base, this apple is good for eating but due to its tender flesh is not a good choice for baking. Fuji – Originally from Japan, this variety has now become popular worldwide and has juicy, crisp flesh and high sugar content. Considered one of the best eating apples, since the flesh holds up well when heated they are also used in baking and are harvested later in the season. McIntosh – This is one variety that is harvested earlier in the season and is either eaten fresh or used in applesauce. Rome – Soft and round in shape, these apples are great for cooking and baking and are the perfect choice for baked whole apples. Gala – This apple comes from New Zealand but is also grown in the US. A medium sized apple, it has a unique yellow and red striped skin. Great for eating fresh, in salads, or also in baked goods and cooking. Cortland – Harvested in September and October this apple is often chosen to be used in salads as its flesh is very white and is slow to turn brown.